Your #1 Source for IBA & Source for KIBA Buy IBA Now! Propagate Plants from Cuttings Using Solutions. Take plant cuttings, usually stem, root or leaf cuttings. Woody cuttings are usually wounded by making a 3/4" notch at the basal end. Herbaceous cuttings are not wounded. 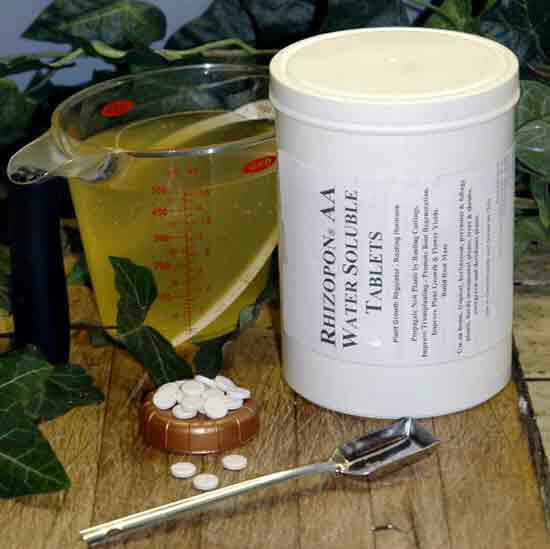 Make up a fresh Rhizopon Water Soluble Tablet solution using the appropriate concentration. Using the Spray Drip-Down Method first plant then treat. Using the Immersion, Quick Dip, or the Total Immerse Method first treat then plant. Take care of the cuttings. Herbaceous plants, such as chrysanthemum, are easy to treat using low concentrations by the Spray Drip Down® Method or Total Immerse Method. The Total Immerse and Spray Drip Down® methods can be used interchangeably. The active ingredients are absorbed into the leaves and stems the transported to the basal end where it induces root formation. The active ingredients are transported through the phloem to the basal end. It induces cell diffusion and root induction in the presence of oxygen and water. These methods retard bud formation; the cuttings to put their energy into root formation. • Tablets contain the active ingredient Indole-3-butyric acid (IBA) 20%. Make solutions up to 3000 ppm IBA. 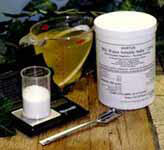 • Tablets useful when a scale is not available to measure Hortus IBA Water Soluble Salts. Simply count tablets then mix. • Makeup small amounts of rooting solution or when neededing low rates. • Use by counting Tablets, then mix into ordinary water. When making a gel based solution, use one of many standard gel products from your horticultural supply. You can also use corn starch from the food market. Then, add the powder or corn starch to the rooting solution until you get needed ‘gel peaks' or somewhat watery solution as needed. Spray the solution evenly over the cuttings until drops go down to the media. First plant the cuttings then treat them. Spray the solution evenly over the cuttings until drops go down to the media. First totally immerse the cuttings in the solution for a few seconds then plant them. Broad leaf cuttings are especially suited for this method. You can use a basket to dip the cuttings in a tub. Prevent bruising by not placing too many cuttings in the solution at once. 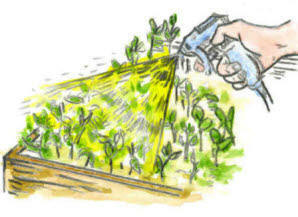 Allow time for the solution to dry on the cuttings before watering, misting or covering. The temperature of the solution should be at least equal to the cutting temperature. A cold solution temperature causes the stomata of the cuttings close; the amount of active ingredients absorbed is reduced. Use the Basal Long Soak Method on cuttings which are more difficult to root or are more woody. 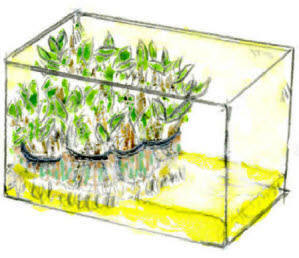 A long soak of the cuttings in a low concentration solution causes the plant tissues to absorb the active ingredients. 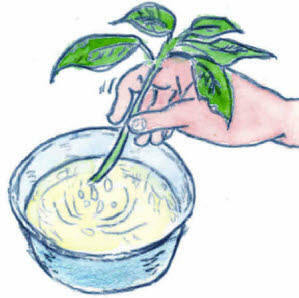 Use this method on plants which may be sensitive to high concentration used in the Quick Dip Method. Immerse the basal end of cuttings approximately one inch in the solution for 12-25 hours nominal. 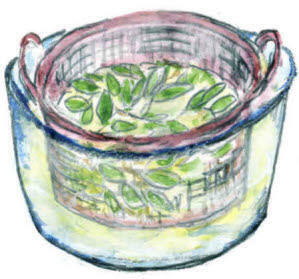 Plant the cuttings immediately or cuttings can be stored in cold storage. First treat the cuttings then plant them. Immerse the basal end of cuttings approximately one inch in the solution for a few seconds. Plant the cuttings immediately. Use the lowest possible concentration of tablets to achieve the desired results. An excess concentration may result in a reduced numbers of roots formed, phyto toxicity, shock, excessive callus, and rooting inequality. Herbaceous cuttings, tropical plants, house plants, roses, etc: 3-10 tablets per liter water. Chrysanthemum: 4-10 tablets per liter water. Softwood cuttings: 20 tablets per liter. Hardwood cuttings: 40 tablets per liter. Difficult to root hardwood cuttings: 100-400 tablets per liter.